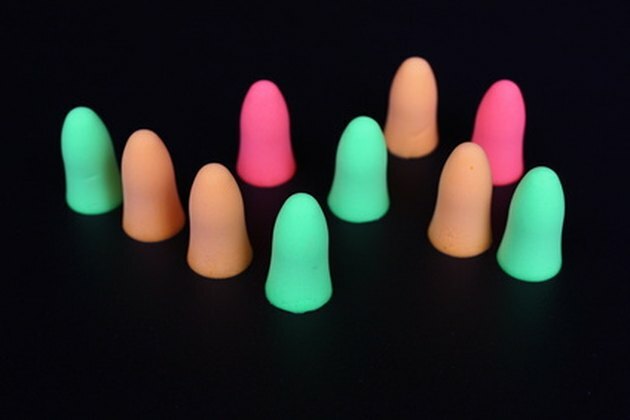 Ear plugs can be used for protection from noise or water. These small, ear-canal shaped devices can be made of foam, plastic or wax and fit into the ear canal, according to Occupational Health & Safety, a health resource site dedicated to workplace safety. While these plugs offer benefits for those who require special protection, prolonged or incorrect use does carry some risks associated with ear plus use. Being aware of these risks can prevent you from causing damage to your ears and hearing. While the movement is imperceptible to most, earwax drains from your ears on a daily basis. However, frequent or prolonged usage of earplugs may affect the ear’s ability to drain properly, according to Go Ask Alice, a health resource website from Columbia University. If earwax does become impacted, you may experience side effects such as tinnitus, or ringing in the ears. Other effects include hearing loss, discharge, pain or infection, according to Go Ask Alice. To prevent this, regularly clean the ears to encourage earwax removal when not wearing ear plugs. One way to do so is to drop one to two drops of olive oil into the ear canal daily in order to remove any wax buildup. Be sure to clean and replace your ear plugs as needed in order to avoid impacted ear wax. While you sometimes wear ear plugs to block sounds, there are some instances where that could be a dangerous prospect. For example, wearing earplugs while driving could prevent you from hearing a car horn or other noise that could alert you to danger. Ear plugs cause attenuation of high-pitched noises, according to Soundid Ears, a Vancouver-based hearing and speech clinic. For this reason, it is important to wear earplugs only when necessary. If you utilize loud machinery for your occupation and are required to wear them, be sure to remove the ear plugs when in other areas of your job that may require your hearing. Be aware that frequent removal can loosen the plugs, however, and they may not provide as much protection as they once did. If you do not properly clean your ear plugs, bacteria can develop on them, according to Fit Sugar. This is especially true for ear plugs made of foam, which provides a hospitable environment to bacteria. The result can be a painful ear infection, according to Net Doctor, a physician-reviewed health and wellness site. You may wish to switch to a pair of soundproofed headphones, which are worn externally on the ears and not as subject to bacterial growth. Net Doctor: Can Earplugs Be Harmful? Fit Sugar: Can Prolonged Earplug Use Cause Damage to Ears?